This is the analysis on which today’s TES article on primary performance is based. 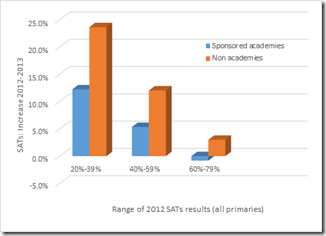 It is important to remember that primary academies have not been piloted in anyway. There is no prior evidence base for the effect of converting an “under-performing” primary school to an academy. Instead a huge experiment is taking place across the country, as primaries seen as in difficulty are encouraged or forced to become sponsored academies. Almost 2,000 primary schools have now taken this step into the unknown. My estimate below is that a primary school staying in the maintained sector improved 5% faster – on average – than one becoming a sponsored academy. There is a massive success story here, with which the DfE should be very pleased - and would be if it was committed to the success of all schools. In 2013 there were 316 primaries that grew their SAT results by at least 20% in 2013 (including only those with more than 25 pupils in Year 6): 94% were maintained schools, 5% were converter academies and just 1% were sponsored academies. The full list can be downloaded here. Thesis: These primaries perform much better if they stay as maintained schools. Political implication: Given a primary school at a particular level (and below the 80% benchmark) it is likely to perform better if it remains as a maintained school than if it becomes a sponsored academy. 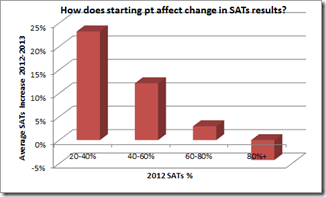 However there is a clear inverse relationship between previous year SAT results and growth in those results. So if you take a set of schools (such as sponsored academies) primarily from the high growth bands they are going to have higher growth than schools overall – even if they are underperforming within their bands. This seems to show fairly strongly that maintained schools do better, when compared to schools with similar 2012 results. The first graph showed the average growth in each band. This can be used to calculate, for every primary school in the country, whether their change in results is above or below this average, and by how much. Recommendation: Conversion of "under-performing" primaries to sponsored academies should be suspended while this effect is examined. It is possible that primary schools, generally much smaller and with less resources, than secondaries face greater challenges if they move away from the local authority. This analysis refers only to "sponsored academies". Schools are generally converted under a sponsor if they are deemed to be in need of signficant improvement. The analysis does not included "converter academies", which are generally schools already seen as Good or Outstanding. 2013 KS2 performance tables: http://bit.ly/KOepvQ. This includes KS2 results for each school in 2012 and 2013. However for most primaries that became academies in 2012-13, it does not include the 2012 results of the “predecessor school”. This makes the above analysis a little complex to carry out and is why, I presume, it has not been done previously by others. Only sponsored academies that had converted prior to 1st January 2013 were included in this analysis. Is this a opportune moment to repeat my belief that the threat of forced academisation has acted as a significant driver for developments in maintained primaries as well as poked the LA's school improvement departments into action~? Is the lesson here that "yes the combined teams of maintained schools with LAs can develop electively but this is only after the huge and belligerent prod from the academy policies and OFSTED? Rosie - Possibly. But it is also possible that the Academisation process in itself compromises standards. There are a number of possible reasons and explanations as to why this may be so. Either way, Henry's revelation destroys any justification for forcing any school to become an academy. If LA improvement departments needed improving then that is what should have been done. It doesn't follow that the damaging and deceitful academisation policy was necessary in order to improve schools; if it did. Absolutely. That's got me off to a good start this week. I wonder if there will be a response?